Saturday, 29th March at about 11 AM I went through a portal in Brixton. 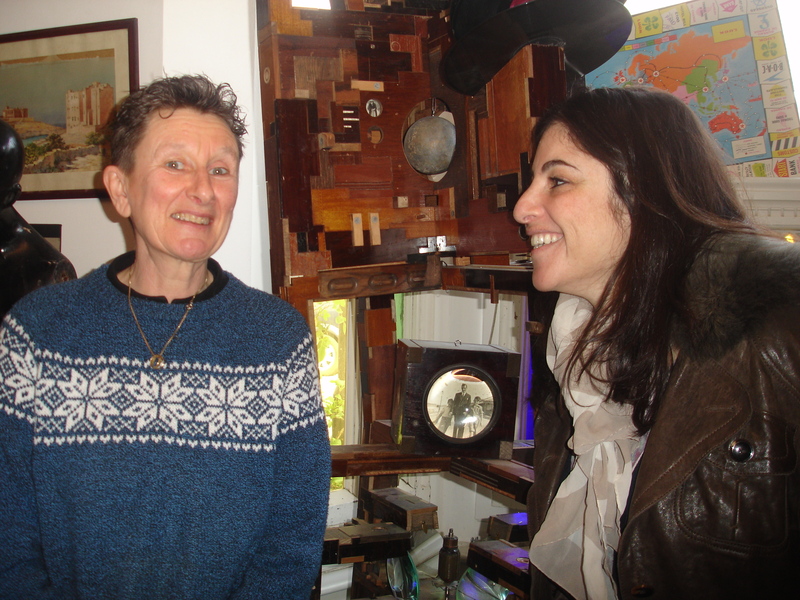 It happened when I was standing in the artist Lesley Hilling’s front room in amongst her clutter and bric-a-brac. All of a sudden I went back in time and space to a state of being I hadn’t felt in decades. The invite from the Knight Webb Gallery in Brixton was for “a coffee morning with artist studio visit”. The plan was to meet at the gallery at 10.00am, have a quick cuppa there, then walk over to the artist’s house where she would speak about her work over more tea and cake. No mention of portals. There was already a dozen people at the gallery by 10.00 AM. I took a couple of photos and noticed many of the sculptures had already been sold. 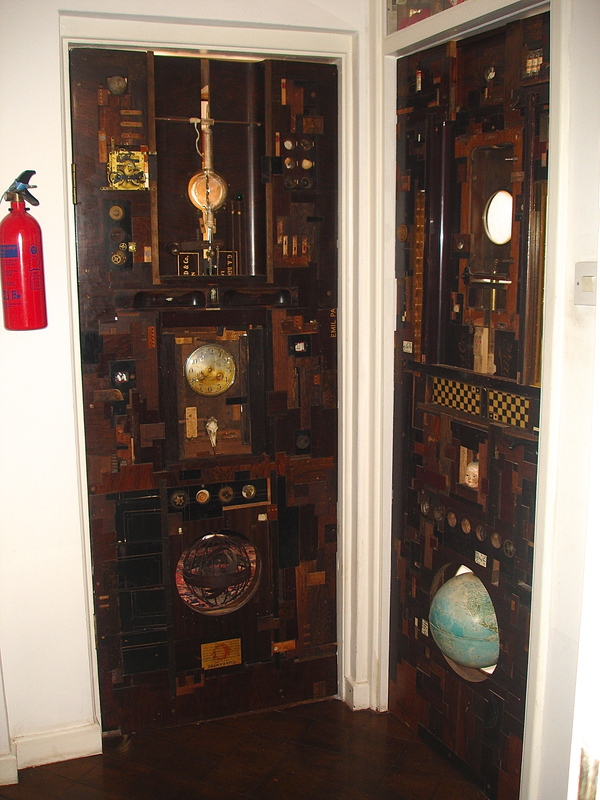 ‘Excellent examples of British art’, I heard someone call them and I kinda understood what they meant, but what made them so special for me was how a load of old junk, disparate bits of wood, glass and bric-a-brac, had been forged into such beautiful, cohesive and perfectly balanced works of art. 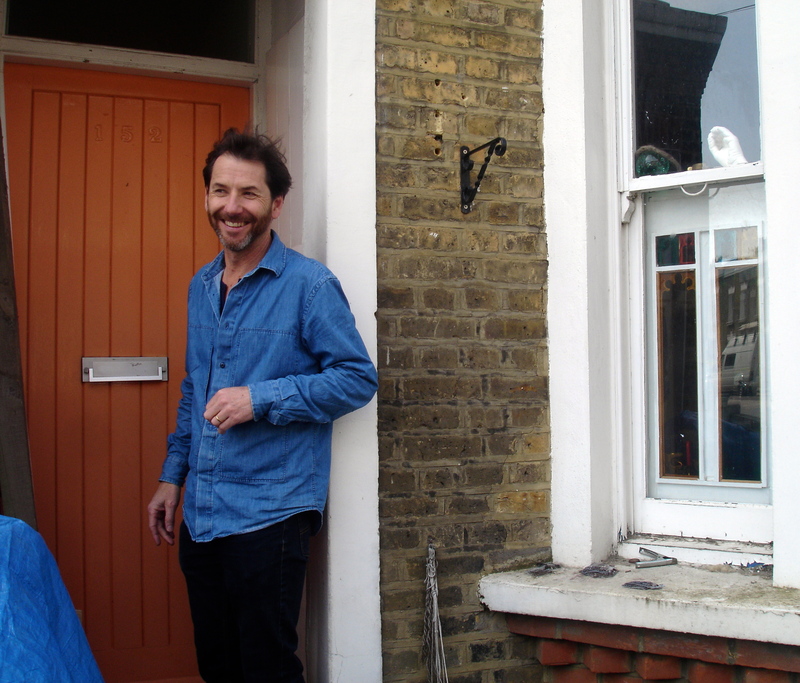 It was a lovely bright sunny morning as Rufus Webb Knight, director of the gallery, led the way over to Lesley’s house. We chatted about the area which I’m not very familiar with and the Brixton art scene and Lesley. By the time we got there, I was feeling rather curious about what to expect. Walking through the front door, I noticed the walls were covered from top to toe with drawings, photos and paintings of people and animals and how the sliding door of the loo was plastered with pages from one of my favourite books, Cristo si è fermato a Eboli (Christ Stopped at Eboli) by Carlo Levi. In Italian, unread and unknown to the artist, she’d stuck the pages on her wall. About 8 of us tried to cram into her studio as she chatted about a door she’s making from mementos that once sat on a mantle piece and belonged to a dear friend’s mum who had recently passed away. Upstairs on her first floor, I saw two more doors made the same way, they looked great in situ and I thought of how they’d make amazing gifts. As in the hall and studio, Lesley’s front room was loaded with stuff: shelves upon shelves of all sorts of everything. 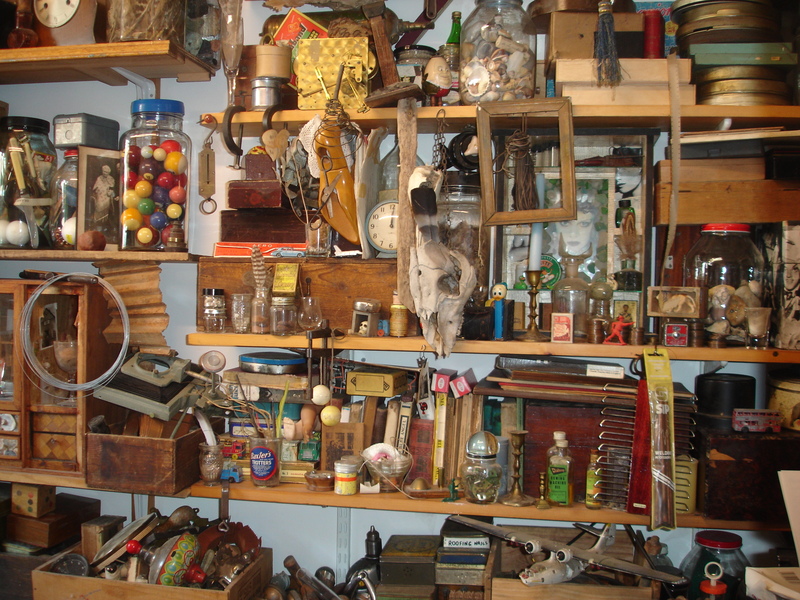 I saw wooden frames, a naked plastic doll, a tin airplane, snooker balls, old clocks, an empty birdcage, a jar of feathers, a vinyl record and basically anything I would have thrown into a black sack given half the chance. Then in a split second it all appeared completely different. Nothing had changed but I no longer saw a load of old junk. Now I was looking at pieces of life and each piece was in its rightful place. I no longer needed to judge or label it. In fact, I no longer needed to judge anything or anyone including myself. We were all just entities, like the bric-a-brac, perfect as we were in time and space. I felt expansive, harmonious and calm, devoid of worry, judgment, waiting or hoping, or any feeling that hankered with the shear perfection of life! All was truly well in that moment and everything was in sync. It was just a fleeting second and obviously I didn’t mention it there and then (what would I have said?) but the memory of it lingered throughout the day. I’m sure I was absorbing the energy of Lesley’s house, there was such a strong creative flow there. When I asked her if I could have a photo of us together she said yes, but that she wasn’t too happy about wearing her mum’s old jumper. ‘Who cares,’ I thought, I just felt so much gratitude for her, for living her life the way she wants, doing what she does. It had brought me back to my own essence, my own creative flow. I was happy as I walked down Atlantic Road back to Brixton tube station and so thankful for having been invited and for having gone. It was a strong reminder of how art and artists are so essential and the joy, not to mention the importance, of being inspired. I’d felt more than inspiration though, I’d gone through some type of portal, or shift on a soul level at least for a split second. In any case, I started writing the minute I got home and didn’t stop until I went to bed about 10 hours later. Since then, I’ve been wondering what it would be like to live in that state of being continually and how Lesley relates to all the pieces of life she collects. I must remember to ask her the next time we meet. 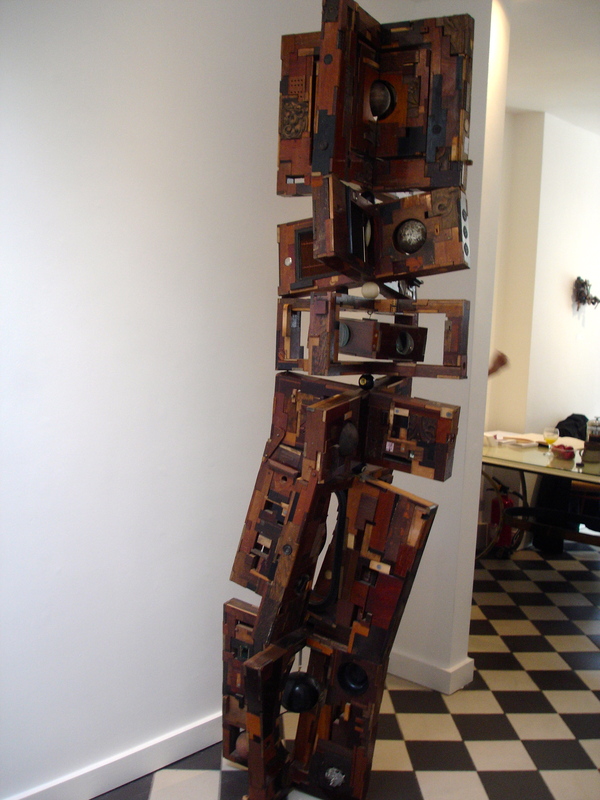 For more info about her work please contact Rufus or Mirri at the Knight Webb Gallery Brixton.